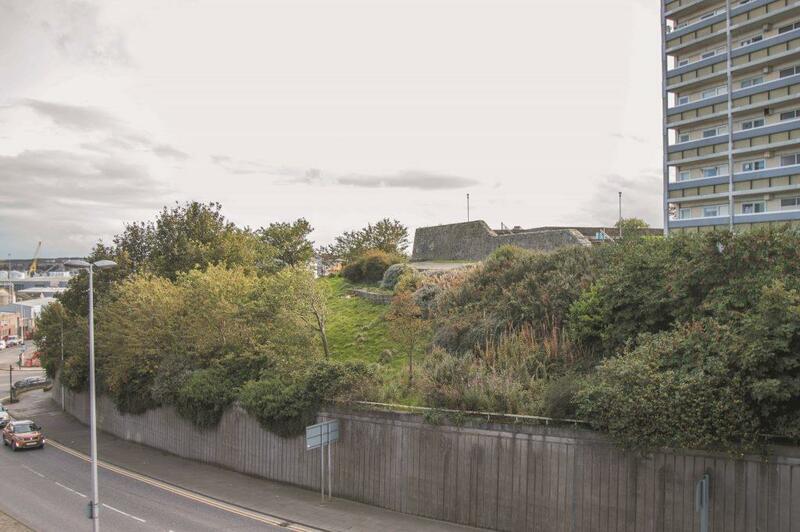 Aberdeen Castle has long vanished beneath successive layers of development in the city. The steep slopes of the castle hill can be seen above Castle Terrace and Park Lane, and accessed along Castle Hill, but there is nothing on the ground beyond the street names to suggest a castle ever stood here. From 1795 the site was used as a military barracks, which was demolished in 1965, and now contains blocks of flats. The medieval town of Aberdeen lay between the castle and the Den Burn, and occupied a low ridge of higher ground overlooking the River Dee, but also extended along Gallowgate towards Old Aberdeen. The castle most likely occupies the eastern end of this ridge, probably separated from the town by a ditch, and may have been founded in the early 12th century, when Aberdeen was made a burgh. The castle was a symbol of royal authority, and at this early date probably consisted of a timber palisade around the summit of the castle hill, a number of timber buildings inside, and possibly a stone chapel. It is interesting to note that St Katherine’s Hill (now completely levelled with the construction of Union Street, but it was just to the east of Market Street), and the Heading Hill (under Hanover Street Primary School) offer similar strengths and may also have been defended – and possible alternative sites for an early castle. The earliest mention of Aberdeen Castle is 1264, by which time it also had a chapel, but probably other buildings suited to a royal fortress, such as halls, the mint, armoury, stables, kitchens and so on. It may also have had walls of stone by this point. In 1291 it was occupied by an English garrison but was handed back to the Scots upon the selection of John Balliol as king. In 1296, the castle was handed over to Edward I of England without a fight, and the accommodation was suitable for him to stay there for a few days; it was described as a “bon chastell”. After an attack by William Wallace, the constable of the castle declared his allegiance to King John, and opened the gates. Presumably it passed back into English hands as it was held for King Edward between 1304 and 1308. The castle was besieged by Robert Bruce in the summer of that year, and probably taken by mid-August. A tradition that the castle was repaired and destroyed by the townsfolk of Aberdeen during the reign of David II postdates events by some centuries, and it is more likely that the castle was destroyed by Bruce, and used as a quarry, although it could have been reoccupied during the wars of David’s reign. If so, it was certainly not reoccupied for any length of time. During Cromwell’s occupation of Scotland, St Ninians Chapel on the site of Aberdeen Castle was enclosed within an earthwork bastion and used as a garrison fort. A map of c1661 shows that the fort was four sided, with an angled bastion in each corner. The fort had been slighted by General Monck in 1659, so the picture is probably an impression of what had been there. By the late 18th century only one angled bastion remained visible, and a new barracks for 600 men was built on the site, further destroying evidence of the castle. It remained in use until 1935, and was eventually demolished; the surviving Cromwellian bastion had probably been used as a gun platform overlooking the harbour.